With philanthropy and environmental consciousness at the heart of Song Saa’s vision and experience, the pioneering luxury island retreat has announced its 2015 ‘Journeys of Change’ program. From May to October, Song Saa will donate three guest stays per month to The Song Saa Foundation, promoting and supporting the sustainable development of its setting in Cambodia’s Koh Rong Archipelago – one of the few remaining, untouched environments in the tropical Southwest. The ‘Journeys of Change’ program is aligned with Rory and Melita Hunter’s ethos for Song Saa: ‘luxury that treads lightly’ and designed for travellers who are eager to actively seek ‘pay-it-forward’ opportunities – a heartfelt holiday and energizing experience that transforms a personal well-being escape into a lasting legacy. Guests quote ‘Journeys of Change’ when booking a minimum 4-night escape at Song Saa Private Island. Guests can then choose whether to be hands-on participants in the Foundation’s ongoing environmental and community initiatives, or be silent donors, basking in the resort and archipelago’s beauty. Spanning the isles of Koh Ouen and Koh Bong, the resort is made up of 27 villas, each built from sustainable materials in perfect harmony with the natural environment. 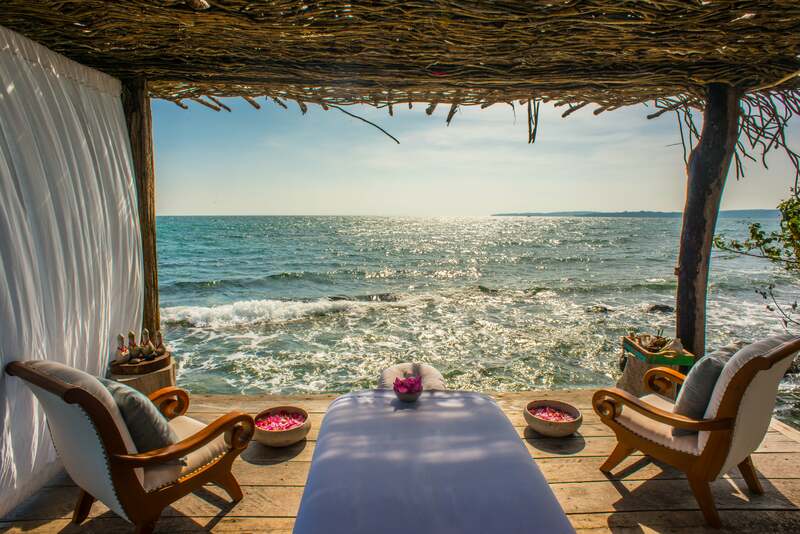 Inspired by Cambodian fishing villages with features such as over-water buildings, thatch roofs and drift wood furnishings, the resort is highly individual in design, uncompromising on luxuries but designed to reflect the simple beauty of the archipelago and its natural surroundings. *The ‘Journeys of Change’ programme is based on minimum 4-night stays, between 1st May and 31st October, with profits from up to three guest stays (per month) donated to The Song Saa Foundation. Other conditions apply. The ‘Always Included’ policy includes five-star accommodation, all meals, house wine, spirits, beer and non-alcoholic drinks, daily-stocked mini bar, daily surprises from the kitchen, 3 pieces of laundry per person per day, return boat transfers from Sihanoukville, internet, satellite TV, guided tours, use of kayaks, sailing boats and snorkelling gear, and a 15-minute foot massage.